Preface. Contents of volumes 1-6. 1. Magnetism in ultrathin transition metal films (U. Gradmann). 2. Energy band theory of metallic magnetism in the elements (V.L. Moruzzi, P.M. Marcus). 3. Density functional theory of the ground state magnetic properties of rare earths and actinides (M.S.S. Brooks, B. Johansson). 4. Diluted magnetic semiconductors (J. Kossut, W. Dobrowolski). 5. Magnetic properties of binary rare-earth 3d-transition-metal intermetallic compounds (J.J.M. Franse, R.J. Radwanski). 6. Neutron scattering on heavy fermion and valence fluctuation 4f-systems (M. Loewenhaupt, K.H. Fischer). Author index. Subject index. Materials index. Volume 7 of the Handbook of Magnetic Materials provides an overview of some of the most exciting topics in magnetism today. Firstly, a substantial step forward in the understanding of metallic magnetism has been reached by means of electronic band structure calculation. Progress in this area has been made not only due to the availability of high speed computing machines but also due to sophistication in the computational methodology. Two chapters are devoted to this subject, one of which is devoted to the elements and the other dealing primarily with 4f and 5f systems, including examples of the large group of intermetallic compounds. In both chapters the authors have concentrated on explaining the physics behind these band calculations. The chapters are written in a manner understandable to scientists having no experience with band calculations. Thin film technology has become a key issue in high density magnetic and magneto-optical recording and will be dealt with in future volumes of the Handbook. The present volume introduces the field with a chapter on the magnetism of ultrathin transition metal films, describing the richness in novel magnetic phenomens that has been encountered in the past few years in these materials. Of equal interest are the novel magnetic phenomena observed when magnetic moments are incorporated in a semiconducting matrix. 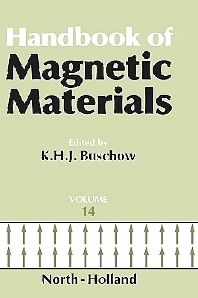 A comprehensive description of these materials is found in the chapter on diluted magnetic semiconductors. A separate chapter is devoted to the progress made in the field of heavy fermions and valence fluctuations, emphasis being placed on the important results obtained by means of neutron scattering. A detailed review of the progress made in the field of rare earth based intermetallic compounds in combination with 3d transition metals completes this multifaceted volume.